Pueblo Revival is a 20 th century adaptation of a building type developed in the late-18th and early-19th centuries in New Mexico 's Rio Grande Valley. It was, and still is, a popular architecture. Pueblo Revival is also called Santa Fe style because the city of Santa Fe, New Mexico, is considered the heart of Pueblo architecture. The City Beautiful-inspired plan of 1912 mandated that every civic structure in Santa Fe be designed in this native style. 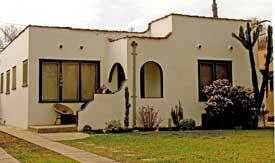 The two architects most associated with the Pueblo Revival style are John Gaw Meem and Mary Jane Colter. From 1924 until his death in 1983, Meem designed houses, churches, and institutional buildings throughout Santa Fe in the Pueblo Revival style that were to become the classic look of New Mexico in the 20 th century. Mary Jane Colter was the architect for the Santa Fe Railroad and the railroad's affiliated Fred Harvey restaurants from 1902 to 1948. The popularity of the Pueblo Revival style received a big boost after World War I, when the railroad started a highly successful tourism program that brought thousands of souvenir-buying eastern visitors to the Indian markets as breaks in their transcontinental trips. Colter also liked to combine the Pueblo Revival with art deco to create a style labeled "Pueblo Deco", which can be seen in her design for the former Harvey restaurant at the Los Angeles' Union Station. Adobe -- a natural material composed of mud, water, and organic materials such as hay, straw, or manure -- was not used in Fullerton as a building material. 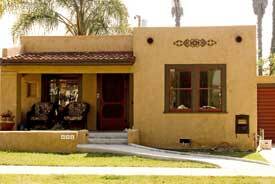 Instead, stucco in warm earth tones was used for Pueblo Revival houses. Unlike some cities in Orange County such as San Juan Capistrano, Fullerton has no commercial buildings designed with the Pueblo Revival style. 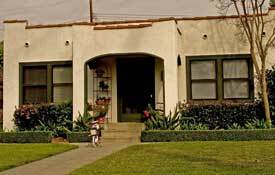 The structures in Fullerton that somewhat reflect the Pueblo Revival style are all small, boxy dwellings that were constructed in the 1920s and 1930s, but not one of these is a true expression of the style. The few examples of this adaptation to the style are found in the historic neighborhoods of Fullerton (e.g., 604 W. Wilshire Avenue; 1105 and 1120 E. Whiting Avenue). Dennis, Lisl. Behind Adobe Walls: The Hidden Homes and Gardens of Santa Fe and Taos. San Francisco: Chronicle Books, 1997. Hannaford, Donald R. Spanish Colonial or Abobe Architecture of California, 1800-1850.Stamford, CT: Architectural Book Pub. Co., 1990. Lumpkins, William T. La Casa Adobe. Santa Fe: Ancient City, 1986. Reeve, Agnesa. The Small Adobe House.Layton, UT: Gibbs Smith, 2001.